With the opening of the Kelana Jaya Line extension to Putra Heights, it is now easier to get to Subang Airport via KJ26 Ara Damansara LRT Station. A new feeder bus from Ara Damansara, Service T773, was launched together with the opening of the new line. This links the station with Subang Airport with a frequency of 15 to 30 minutes and provides a new “rail to bus to airport” transfer option. To get to the bus, once you exit the station, head straight, following the shelter. Head downstairs to the bus station at the end of the shelter, following the signs pasted around. It looks like a car park on first sight, but it is actually the bus station. It looks a little incomplete, but it is the actual bus station. Wait at the opposite platform for the bus. The T773 to Subang Airport will stop here. The relatively empty bus. Perhaps not many people know about this service yet, or I just boarded it at a time where there are not much flights. Approaching Subang Skypark Terminal 2. The bus stopped me at the terminal driveway proper, but the driver did kindly inform me that not all drivers would do this as the exit ahead is very tight for buses. Do expect buses to stop along the main road (which was what I expected anyway). The journey from Ara Damansara LRT Station to Subang Airport took around 10 minutes. From here, hop on to your plane, or if you’re like me and not flying anywhere today, you can head back from the airport with the same bus. Head upstairs towards the viewing gallery to cross the bridge to the other side of the road. This is the same iconic bridge that you will see when arriving at the terminal. Once you get to the other side, just wait at the side of the road and flag the bus when you see it approaching. The bus arriving at the pick-up location. 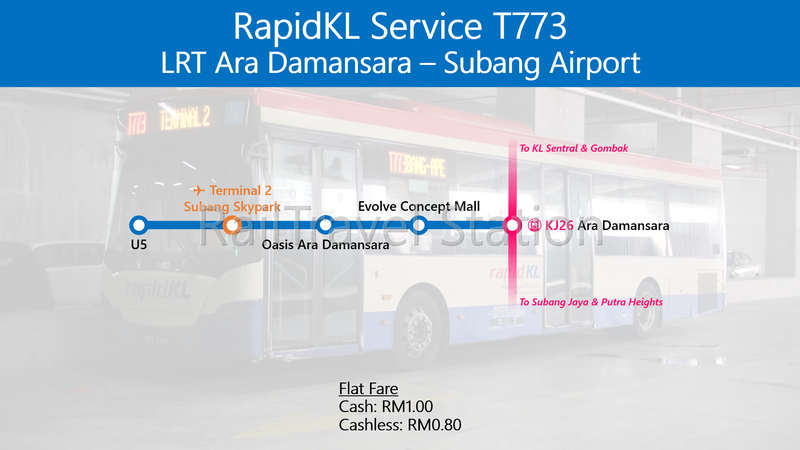 You can also catch passing-through Service 772 from Subang Airport to Ara Damansara LRT. Service 772 will continue onwards to Pasar Seni via Federal Highway, which also means it’s not something you want to try during peak hours. The bus resting at Ara Damansara before working on the next trip. No more need to get a cab and get stuck in a jam when travelling from Subang Airport anymore! Thank you very much, this is very helpful. I just wish it appeared at the top of the search engine so that more ppl gets the same help I got.